Wednesday Walk is a challenge started by me, the idea is to get out for a short walk and get some shots of what you can see within a short distance of your home office or wherever you start. And this is my entry for this week, but first, let me explain the challenge. Try and get out once a week for a short walk, can be from your office, home or anywhere really and walk for a few blocks or a few minutes looking for things to get shots of. Your walk does not have to be on a Wednesday I just ask if possible to share your walk photos on a Wednesday. You can look for anything in general or decide on one subject you want to get shots off. Do a post with the shots you get on a Wednesday and tag it with #wednesdaywalk, also if you happen to join, please leave a link to your post in a comment on this post and I will try and visit them all. Following me and resteeming the post so more see it would be appreciated but isn't a rule just a suggestion, but you may have a better chance of receiving a Steem Basic Income Share if you do. I will try and visit, resteem and upvote all who take part in the Wednesday Walk, plus I will be sending @steembasicincomeshares to a selection of those who participate. I did many walks this week but decided to share a walk I took around Mondo Ponds trails, here in Milford, CT. This first shot is at the start of the travels, as you can see most of the trees are pretty bare still but still was a lovely walk around the trails, and there were even some signs of spring, you can see some daffodils coming up just the shoots at the moment and not flowering but very soon they will be. A walk around the ponds post would not be complete without showing the ponds in at least one shot so here is a shot across a part of one of the ponds, with some nice reflections on the still water, and anyone who has followed me for a while will know that I do love reflections. Keeping with reflections for this next shot, I liked how they were framed bby the tree branches in this spot. And I even came across a small bunch of spring flowers as you can see in the next shot, what I did on the walk, was walk around with my 24-240 Lens and a second walk with my macro, and strangely enough when I got back to the area where I saw this flower and wanted to get some shots with my macro lens I could not find them again, but I did find one spot where it looked like a dog had done some digging, I have to wonder if someone let there dog dig them up. Now I heard many birds on the walk and thought I may have been able to get some shots for Feathered Friday hosted by @keithboone, but even though I saw a couple of cardinals flying around I never got close enough to them to get a shot but I did get this shot of one bird I am not sure what type of bird it is. And here ends my Walk for this week. Steem Basic Income is a social experiment to bring a basic income to as many Steemians as possible. Members join by sponsoring others into the program. Steem Basic Income is delivered through providing regular upvotes to member content. so I have decided to send some Steem Basic Income shares to 5 people selected through a random draw so on the weekend all people who joined in last weeks Wednesday walk. to @goat-girlz, @elizacheng, @melinda010100, @karbon, @sketch.and.jam, all people who joined in last weeks Wednesday walk. I hope a few of you may find this an interesting challenge and decide to join in. Unless stated otherwise all photos used in my posts are taken and owned by myself, if you wish to use any of my images please contact me. 🎁 Hi @tattoodjay! You have received 0.1 STEEM tip from @traciyork! Very nice! I think my Wednesday Walk is going to be more of an indoors thing, but it should still be pretty good. Awesome shots! You live in a beautiful area. JJ. I always enjoy your nature walk there. U&R. My link to Wednesday Walk. That looks like a wonderful spot to take a walk. Your photos are awesome! Spring is already felt! This park will be very beautiful when the trees put on foliage. A lovely walk and a great photo of that lovely crocus. 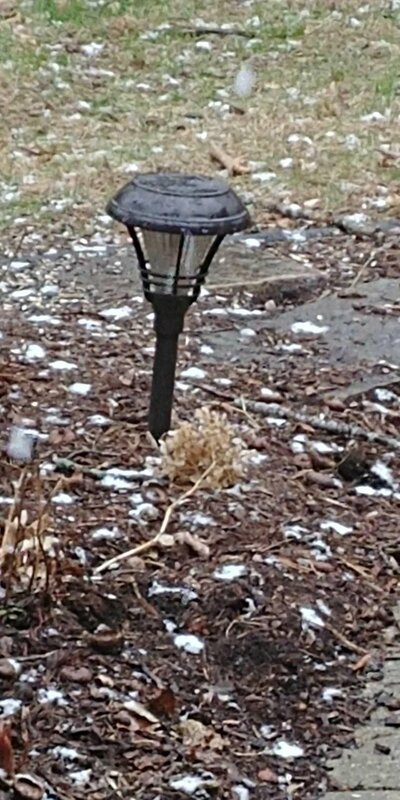 The bird is a Robin, and the ones at my house are not going to be happy, as they are saying there is snow in the forecast today. Thanks for the sbi! It's much appreciated. Resteeming. Here is my walk... https://steemit.com/wednesdaywalk/@melinda010100/wednesday-walk-613eca70fba0e. I hope that denial thing works for you. I will try that too, but as dark as the sky is getting I'm rather afraid it will not work out for me! It doesn't appear to me that our temps are low enough for snow. Mid to upper 30s. I'm hopeful it will all be rain. I'll soon find out! The moment I sent that comment I looked up and it had begun snowing the biggest snowflakes I have ever seen! I could hear them hit the ground. The ground is covered with slush and it is still coming down. Thank you so much @elizacheng and @tattoodjay!! It looks like spring is right around the corner in your neck of the woods. Great pictures, espically enjoye seeing the flower blooming, that is always a good sign @tattoojay. We still have plenty of snow on the ground, but with the Robins returning, Old Man Winter can't hang on too much longer. Nice Mondo Ponds scenery and trees with reflection. Last Sunday while out in town I decided to go for a walk along the river. 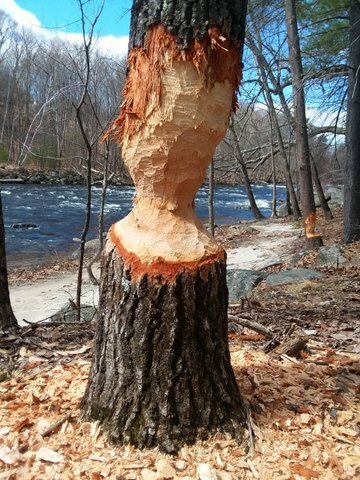 I was very surprised to see so much Beaver activity. The river runs very swiftly and especially this time of year. I searched around and could not find their den. The weather is supposed to be good this weekend. I'm going to explore more. I think Connecticut has a lot of beautiful spots and this is another one of them. My mother lived in Middletown for many years before moving to Florida. One thing I remember about Connecticut that I thought was smart was that stoplights turned red in all directions stopping traffic for the pedestrians to cross. Does it still happen this way? I haven't been back in at least 30 years. Connecticut is the only place I've been to that does it...or that I noticed anyway. Oh no, @traciyork! you've got snow? The sky is dark and the wind is picking up here. A change is in the wind! Beautiful photos, Jay.. I love the reflections! Good post for it already started this morning @tattoodjay! You just got a 5.39% upvote from SteemPlus! I always love shots of trails and water. My #wednesdaywalk was in the woods as well. Nice close up of the crocus. I love the fact that it is attracting post from all over the world and country. I love seeing the different areas, I mean it would be pretty boring if everyone had the same back yard. I love those reflection shots also, and you got a couple of really nice ones. So many pictures so little time. 60 wednesdaywalk post, no wonder I have to spread my vote a little thin at times, at least I can always find a nice post to vote and comment on when in the mood. no last hour entry for me this week. took a few days, started on Monday, did some photo edits/fixes on Tuesday, finished a couple up this morning, and got the post done. So glad to see so many participating. 🎁 Hi @worldschoolerboy! You have received 0.1 SBD tip from @tattoodjay! Beautiful shots, @tattooedjay! I love reflections too. They can be magical. I believe your spring flower is a crocus. They are always the first to emerge. And I’m pretty sure your bird is a robin. I am forever trying to get pictures of cardinals. They so quick and skittish. 🎁 Hi @trudeehunter! You have received 0.1 SBD tip from @tattoodjay! Here's my entry for this week. Looks so peaceful with the still water and the reflections. Your UA account score is currently 5.031 which ranks you at #1106 across all Steem accounts. Your rank has improved 5 places in the last three days (old rank 1111). In our last Algorithmic Curation Round, consisting of 234 contributions, your post is ranked at #37.